Whether it’s a TV in the kitchen you want attached to a movable bracket, or the big LED in the lounge needs to be hung flush to the wall, or you’re a bar owner looking to wall mount several TVs in your venue, the team here at Slough Aerials & Satellites can help. However, don’t start thinking that connecting sets to brackets and brackets to walls is a walk in the park. Far from it. With the huge size of some sets, it’s a very tricky procedure, which is why many people in Middlesex, Berkshire and Oxfordshire prefer to entrust the job to us. The Technicians here at Slough Aerials & Satellites are ultra-experienced at this type of work. 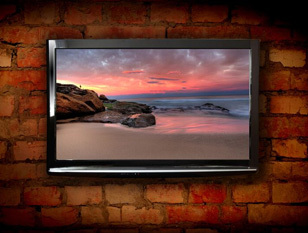 Whatever your television, whatever your bracket and wherever you’re wanting your television wall mounted, we can carry out the work to the highest, safest standards. And we even know the best things to do with the wires to ensure they stay out of sight and don’t affect your viewing pleasure. There are other situations in which you might need to call on our TV wall mounting skills. Like if you’re moving furniture around in your room and want to change where your TV hangs. Or if you’re moving house and want your wall-mounted TV safely taken down in your old home and/or put back up in your new place. Either way, call the TV Wall Mounting Experts at Slough Aerials & Satellites on 0800 051 7674. THE MOST RELIABLE TV WALL MOUNTERS IN SLOUGH? There aren’t many pubs or bars or clubs that don’t use TV screens to help entertain their customers and members. In such locations, having TVs mounted on walls is the only sensible, space-saving option. If you’re opening a new venue, or having a refurb, just call us in to make sure your TVs work well and add to the ambience. Service configurations – connecting TVs to broadband, via Wi-Fi or a fixed ethernet cable. Explaining how everything works in an easy to understand way. And don’t forget, if anything to do with your TV service isn’t behaving as it ought to, the team here at Slough Aerials & Satellites are the people to call. Our number is 0800 051 7674.